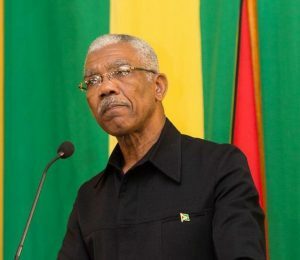 President David Granger on Wednesday distanced his administration from the decision to remove two columnists from the state-owned Guyana Chronicle newspaper, but refused to say whether he found some of the writings of Professor David Hinds and Lincoln Lewis irresponsible. “It’s not for me to say. As I said, I did not appoint them. I don’t know what circumstances governed their relationship with the paper and I am not going to express an opinion on the content,” he said when asked whether he had found any of the columnists writings to have been irresponsible. Noting that during the past three months, regional radio stations have been launched in keeping with government’s public information and broadcasting thrust. “We must ensure that the public, particularly through the State media, receive information which would help them to make decisions so there is a role for public information… The Chronicle is a public information medium,” he said. Stressing that it was up to the editor to select, choose and decide the course of the publication to ensure that his publication is newsworthy, the President denied that there was political interference. “I have not interfered. My government has not interfered and I would urge that we continue to- and we do- to support on our part the free flow of ideas; this is guaranteed in the constitution,” he said. Granger’s denial of political interference came the same day that Professor Hinds, who is an executive member of the Working People’s Alliance (WPA), stated that the Alliance For Change component of the coalition had spearheaded his and Lewis’ removal as columnists with the blessings from the People’s National Congress Reform, the single largest party in the coalition. “The PNC section is being blamed for what was executed by the AFC. But the public utterings of the party’s General Secretary, suggest that they have no problem with the action—a case of the AFC doing the dirty job for them. One must ask if a government is prepared to encourage that kind of behavior towards a coalition member, how would they behave towards presumed enemies. There is something very ugly about government leaders stifling free expression and still preach about the beauty of democracy,” Hinds said. Those voting for the removal of the columnists included Board Chairwoman, Geeta Chandan-Edmond and Sherod Duncan who are both government employees and AFC members. The Guyanese leader reiterated that he is a strong supporter of a “free”, “responsible” and educated press. Contrary to claims by Hinds and Lewis that the government appeared to be following in the footsteps of previous administrations as far as tolerance of criticism is concerned, Granger made it clear that he was not opposed to criticism. “As a politician, I welcome criticism because this helps me to correct faults and to improve the quality and the performance of the government,” he said. Granger said he was unaware if there was a contractual relationship with the columnists, if it was broken or whether there was improper action. 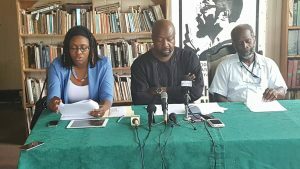 The one-vote majority by the Board of the Guyana National Newspapers Limited to uphold the decision by Editor-in-Chief, Nigel Williams’ decision to ban Lewis and Hinds as columnists has since triggered the resignation of three board members- Bert Wilkinson, Karen Davis and Tabita Sarabo-Halley. Ruel Johnson said he would resign from April 1, 2018 to allow him to conclude a concept note on the future of the government-controlled publication. Sarabo-Halley is Chairwoman of the Working People’s Alliance.